I've not used this stand alone printer for some time and when I put the memory stick from my Olympus camera into it I got a message saying "Card reading Error". I then changed the memory stick and put one in from a Canon digital camera and it printed a photograph which was all green in colour. I assume I need a new printer cartridge but can't see a number on the existing one. Is there a problem with the printer and not just the cartridge? This may be due to needing a replacement ink cartridge. Printing green photos suggests that the magenta ink may have run out so you'll need to buy a tri-colour cartridge which contains all three colours (cyan, magenta and yellow). The Photosmart 245 printer uses HP 57 tri-colour ink cartridges as listed on this page. If the problem re-occurs when you install a new ink cartridge please contact HP for further details. Fast and clear printouts are what the HP 245 has a reputation for. Some day in the future your HP 245 will run dry of printer ink, and when it does you'll quickly notice that buying HP 245 ink is often really pricey. You do not need to bother about dishing out the steep costs you'll discover on the main street because here at Cartridge Save you can find all the HP 245 cartridges you'll ever need at seriously small prices. Spend less money on your ink by buying online with Cartridge Save! There's absolutely no reason why you should spend so much on the 245 original cartridge or 245 compatible ink in the high street when it is much easier to save a pile of money shopping with Cartridge Save. Have one hundred per cent confidence when purchasing PhotoSmart 245 ink cartridges from us as they all are protected by a cast iron money back guarantee. Don't forget that every single order comes with free delivery, mostly arriving at your address on the following working day! Specifically designed for portable photo printing, the HP Photosmart 245 is one of the earlier portable models from HP. It can print 4x6 inch photos in less than 1.5 minutes, with excellent quality for on the spot printing. 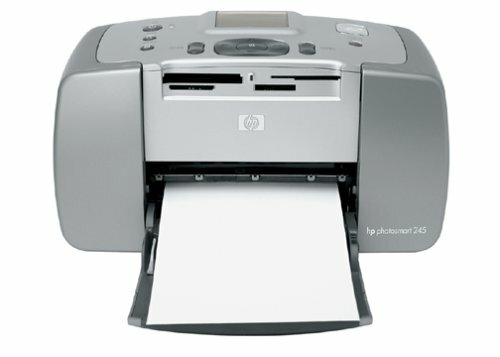 The HP Photosmart 245 is the base model for the series, offering all the basic features, including the 20-sheet flip-up paper tray, control panel, and LCD display. However, it does not offer PictBridge support, and the LCD display can only show text for doing minor adjustments or selecting photos and options. The HP Photosmart 245 is a compact photo printer measuring approximately 8x5x4 inches and weighing only 3 pounds. Its portable design makes it very useful for those in need of a machine that can easily be hooked up and used whenever and wherever. The Photosmart 245 has 5 media card slots for PC-less printing and a USB slot for connecting to Windows or Mac computers. The HP Photosmart 245 printer comes with photo enhancement software that allows users to do simple edits and adjustments to pictures. The machine can read a variety of memory cards, but those who want a portable printer with a direct from camera printing option will have to look for a machine other than the HP Photosmart 245. The maximum resolution that the machine can produce is 4800x1200 dpi, and average printing speeds are quite fast. While many are satisfied with the photo-centric features of the HP Photosmart 245, others feel that its lacks of a display where pictures can be previewed, as well as its lack of PictBridge support, makes it unsatisfactory for their specific needs.